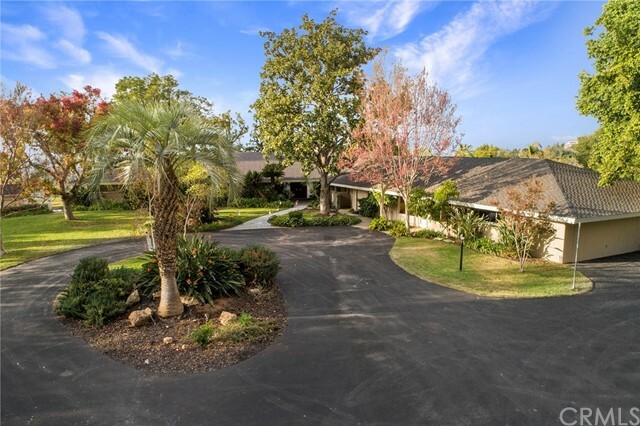 HAWARDEN HILLS- PIEDMONT ESTATES- Reminiscent of the mid-century residences of Beverly Hill&apos;s famed Trousdale Estates Neighborhood, this sprawling custom single level residence was designed for and served as the family compound for three generations of the Bourns Family for its entire 70 years. Now offered for sale for the first time, this time capsule offers an exciting opportunity for that buyer seeking a true Architectural artwork. Unspoiled with all of the original cabinetry, fixtures, appliances, aluminum framed windows and sliding doors, bathroom and lighting intact and impeccably preserved. The building site is unlike any with its over one acre hilltop pad affording 270 degree views to the South, North and West. A large circular motor court atop the 200 yard driveway protected by automatic gates welcomes residents and guests to this truly restful environment. The grounds are enhanced by the mature specimen trees, original Paddock Swimming Pool and elaborate pathways and gardens enveloping this hillside retreat. Sunken formal living room with raised stone hearth; Massive family room with cove coffered ceiling with intricate wood trim and built-in media cabinets; Beautiful dining room with indoor waterfall and views across the pool to the city lights and mountains beyond. A total of 5 bedrooms with attached guest/maid&apos;s quarters with kitchenette and living room. A once in a generation opportunity to acquire such an outstanding pedigree property!